And Wendy had a surprise gift for him! It is obvious to me that Anderson is doing some hard sell promotion. His hanging with the celebs is really annoying. As someone said to me, "There are just too many people who think they are important doing too many talkshows." Anderson has nothing new to offer. Wolf's 360 was on but I didn't pay close attention until the end when he announced he would do his own Ridiculist. And it was really good. If anyone didn't watch the show, take the time to watch the Ridiculist clip here on ATA, it's worth the three minutes. Kudos to Wolf. @Anon 12:03 AM - of course Anderson is out there promoting his show. It's something you gotta do whether you're a host or a TVshow/movie actor or a singer promoting the new album. 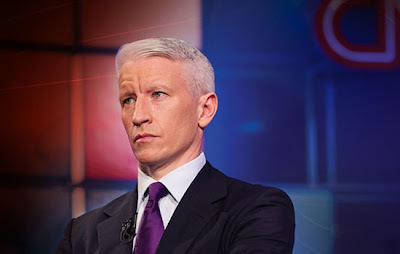 After seeing lots of promos for Katie Couric's new show, I'd be worried if Anderson wasn't out there trying to drum up viewers.